Referred to by some as "Tulasi" or "Tulsi," basil is considered in India to be a plant that is sacred. A true staple of households in India, the herb is part of the mint family and can be had in numerous varietal forms. Basil has a storied history of use that dates back centuries, and it is favored by cultures across the globe for the teas, powders, and oils for which it is the basis. The thought is that the royal oil works to add strength to both the heart as well as the mind. It has the desirable attributes of being anti-inflammatory, antibacterial, antidepressive, and antioxidant. Given its numerous positive characteristics, it is not surprising that the oil also works to boost hair and skin health. 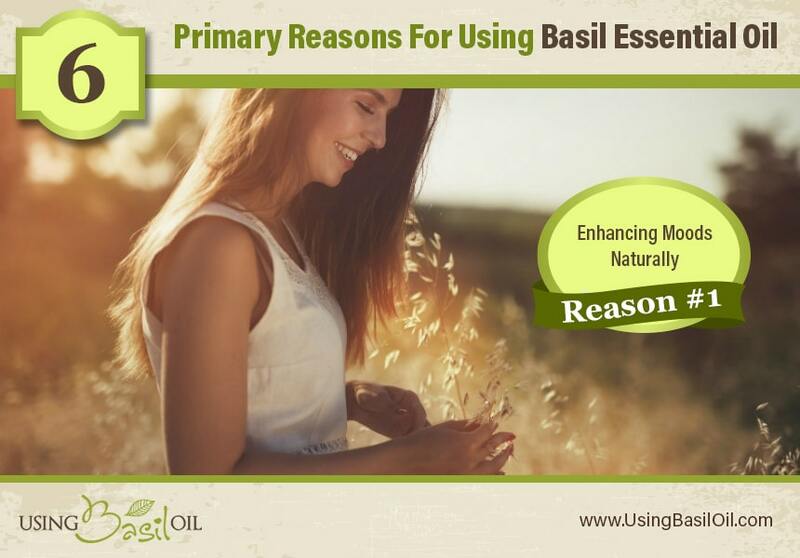 Used optimally in the morning as well as later in the daytime hours, basil oil is an amazingly energizing product. The act of inhaling the scent of basil is known to rejuvenate one's sense of alertness and also combat nagging fatigue. The oil serves as a naturally-derived stimulant able to produce effects on the adrenal cortex, not to mention the entire nervous system. It ameliorates unpleasant symptoms such as muscle soreness, lethargy, and foggy brain. By diffusing some essential oil of basil in the home or inhaling right from a bottle, it is possible to experience healing of adrenal-related fatigue. A great way to achieve an instant spark of energy is to apply a few drops to the back, wrists, and chest area. The mood lift that results from its use is sure to be a marked difference from the discomfort caused by chronic or adrenal fatigue. Part of the appeal of basil oil is its light, fresh, and attractive nature, which makes it ideal for scalp massages meant to stimulate hair growth and circulation. 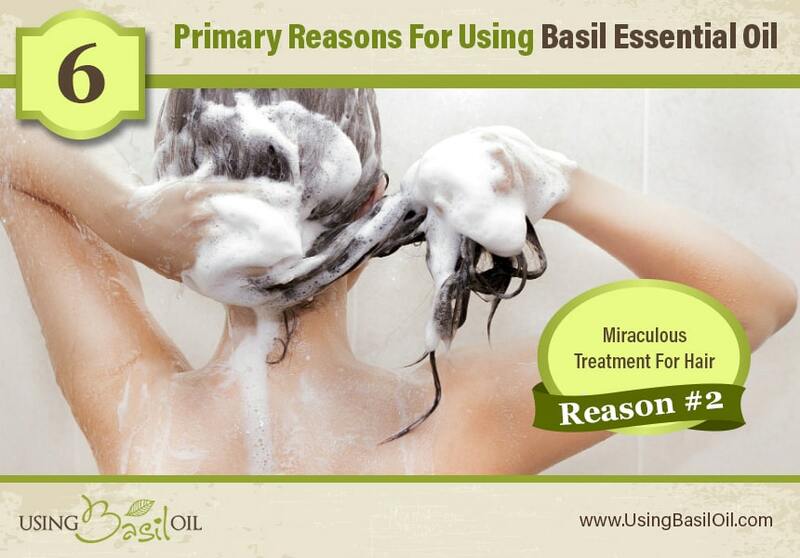 Basil oil is a common ingredient in a wide array of conditioners, shampoos, and aromatherapy preparations. 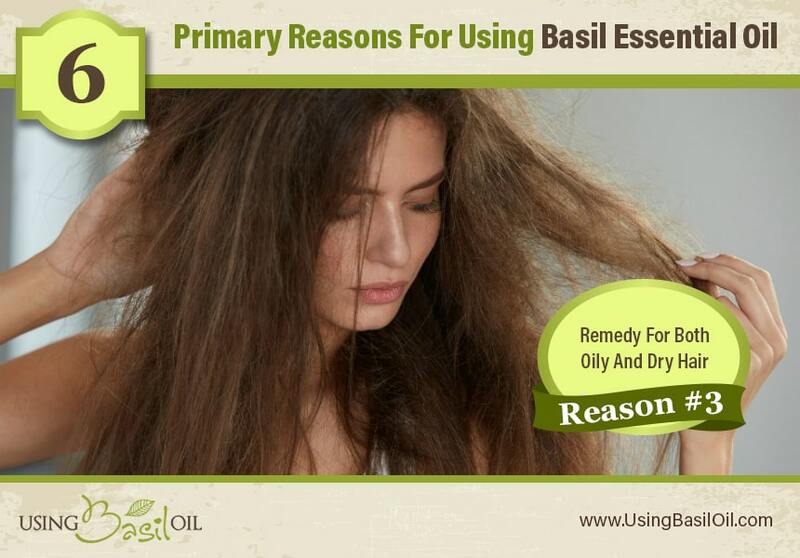 Essential oil of basil can also promote improvements in the condition of hair. Those who are experiencing undue stress or strain due to issues with their hair ought to continue reading how basil oil can help. To address hair that feels unusually greasy, just drop a small amount of essential oil of basil into a favorite shampoo. Or create a homemade treatment product by combining the oil with a bit of baking soda to eliminate the production of excess skin and hair oil. The result is dramatically healthier looking hair. Those with oily hair can get a quantity of curd sufficient for their length and then combine anywhere from 5-10 drops of basil oil into it. Mix thoroughly and spread the mixture atop the hair. Allow this to sit for half an hour and rinse entirely with shampoo, followed by a conditioner. The resulting softness and shine are sure to impress. Individuals suffering from dry hair can follow the recipe described above with the single addition of two tablespoons of basic honey. Honey works to combat frizziness and also to add moisture to the hair. In combination with the curd, this mixture is successful in limited hair breakage and is more effective than other popular treatments. Essential oil of basil provides a pleasant air of freshness that works to relax as well as provide real rejuvenation. By diluting the basil oil with V-6 or a similar carrier, it is possible to use it directly on the skin. 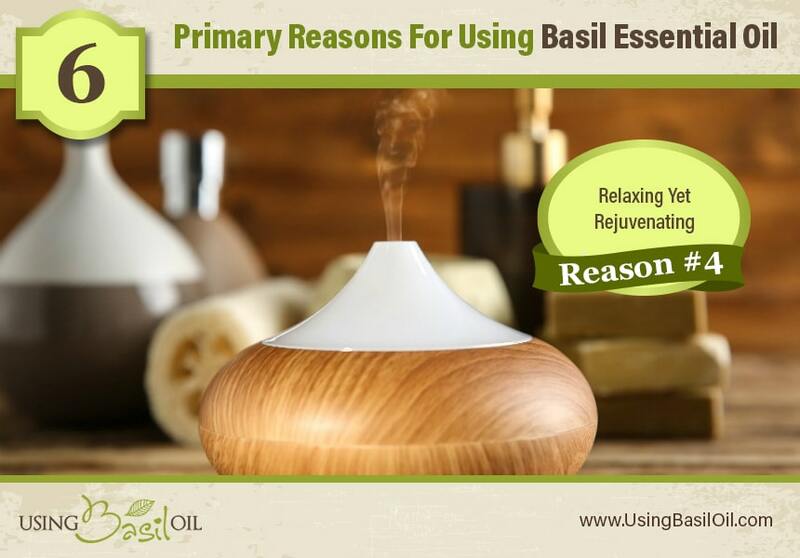 An easy way to discover the positive attributes of basil oil is to utilize a diffuser designed for aromatherapy use. 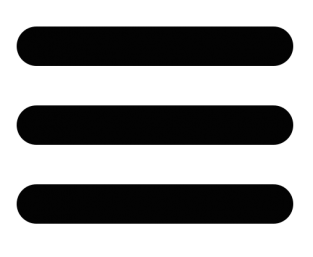 Those who do not own a diffuser can place the oil in a pan containing warm water that is set on the stove. Topical application can take the form of 2-4 drops dabbed directly onto the skin. There is no need to dilute except in the case of highly sensitive skin. For aromatherapy usage, diffuse the oil for 1 hour on three occasions each day. Be sure the oils are kept away from children, use them only for external applications, and never place them near mucous membranes or the eyes. Those who are pregnant, who are nursing, who take medications, or are suffering from any sort of medical condition must speak to a doctor before using oils in these ways. 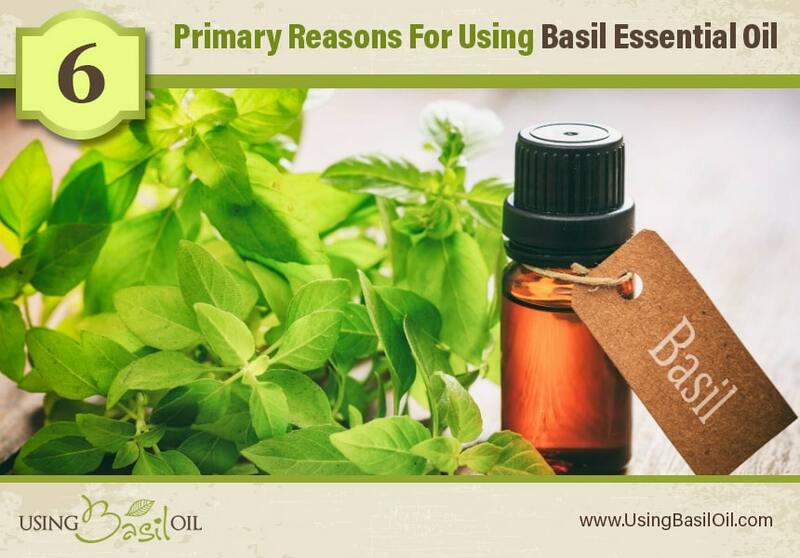 Acne, as well as other types of skin issues, have long been known to respond favorably to basil essential oil. Because breakouts tend to be the result of bacterial accumulations, small infections, and excessive amounts of fat, basil's antibacterial characteristics are ideal for treating them. Many commercial skincare preparations aimed at improving skin tone have basil oil as a vital ingredient. Because of its widespread use as a skin treatment, basil oil is found in a wide array of popular products. However, it is possible to use the oil itself, diluted with a carrier for direct massage into the user's skin. Previously dull hair and skin will begin to look more radiant by the day. Studies have suggested that not only is basil a delicious part of any recipe, it also provides essential safeguards against foodborne ailments. Basil has been a major culinary addition to food and drinks for hundreds of years. The Journal of Food Protection reported in 2001 that basil oil succeeded in limiting the spread and lifespan of a whole host of hazardous microorganisms found to have been in contaminated foodstuffs. Researchers explored the protective properties of an array of essential oils, including those derived from oregano, fennel, cardamom, and parsley. Basil oil showed the best outcomes of any of the oils tested. In fact, basil was responsible for the destruction of the vast quantity of dangerous strains such as Staphylococcus aureus, E. coli, Listeria monocytogenes, lactobacillus, and more, all of which are capable of causing severe illness and even death. Basil essential oils available for purchase can vary significantly in chemical makeup, depending on their source. It is best to seek out those oils containing a high linalool component and a low concentration of methyl chavicol, which is thought by some to be carcinogenic. Oils high in linalool tend to smell better. Further, linalool is believed to work well in repelling insects. Steam distillation is the method used to extract essential oil from the basil leaf. This preparation yields high levels of linalool, rendering it perfect for a series of topical applications. This type of oil is also used for cooking and, as a diffused oil, can significantly improve focus and breathing ability while also lowering stress levels. 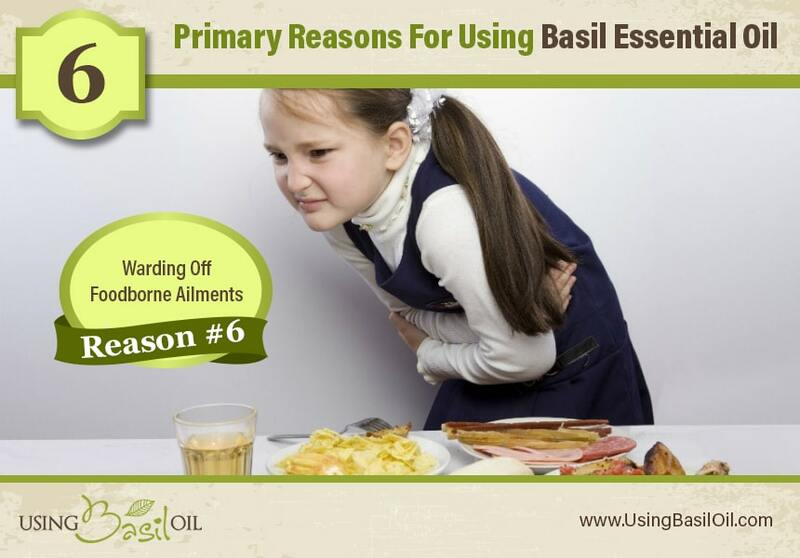 There are some who will suffer from skin irritation as a result of basil oil use. It is, therefore, wise to keep all essential oils, including basil oil, out of children's reach.